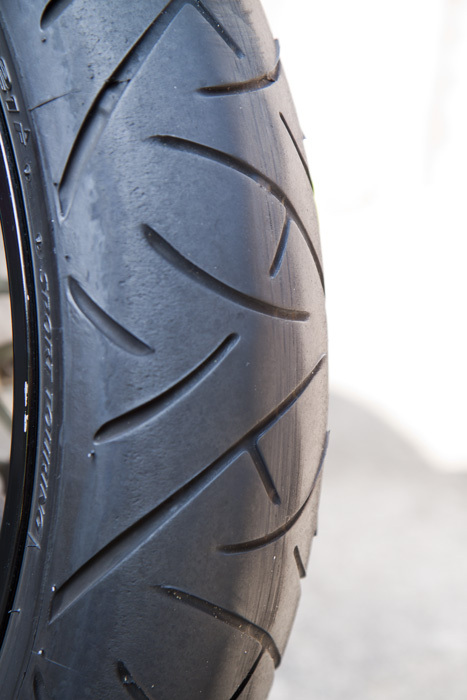 Battlax BT-021 is a real winner from Bridgestone tires when sport touring. I have done 12000 miles on the rear on VFR800, most of it when touring the Europe but that includes high speed flights in the southern France with pillion plus luggage that was easily over 40kg. I say flights because it really felt like flying across the mountains on those motorways. Before the tour I did some short blasts locally, and on my return from Europe I have done one track day on them. It was still enough rubber left for another couple of thousand miles. How is it possible? I don’t know. Fact is that the wear resistance from the middle compound is excellent. From the touring experience I can tell this was an excellent tire for the adventure. Felt exceptionally stable at high speeds and also safe with the loaded bike. It had enough grip on shoulders due to the softer compound used, which gave me a lot of fun on winding roads across Pyrenees Mountains. That is how you build your trust to Bridgestone tires. BT-021 were recommended to me by a guy who did Europe tour some years before but I’m not sure if he actually went on them. 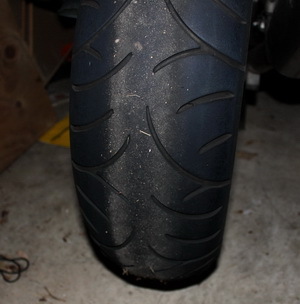 For me though this is probably one of the best tires I could chose for the purpose of sport touring. Reliable in wet conditions but probably not the best. I wonder whether I was ever happy on wet with any tires. Probably not. On the track there are not too bad considering they’re not typical sport tires and they had the profile already changed a bit after Europe. They felt quite sticky on cornering as it got to their temperature rather quickly. On that circuit they say three laps before your rubber worm up but with BT-021 they were ready after the first lap. Consequently, towards the end of session the tires got probably too soft on shoulders as the temperature kept rising which resulted in some peeling from on their sides. The feeling was as if they sometimes slip little bit on corners. After that day I did remember thinking of not using sport touring tires any more on the track days. My conclusion is that with its exceptional wear and sticky sides Bridgestone tires BT-021 is an excellent choice for sport touring. With them on, one easily gains the confidence on roads. However, I would not recommend them if you take your bike often to the circuit. This is how it looked at the end of life. You can notice the step from the middle-harder compound to the sides-softer compound. Towards the end of the tire life you may feel this but I don’t remember noticing it. Surely, I have noticed the difference in profile when I changed the tire. After another couple of long distance tours I had a look at the front one. Pretty much the same situation. The step from the hard to soft component is evident but the tire thread is still legal after 16800 miles. The longitudinal marks are because I turned the wheel whilst the bike was on its center stand when cleaning. From the front I could easily feel the step on turning from one side to the other and it's not the best feeling. Luckily on my last tour there was no such thing like rain so did not have to worry much for the grip. The other thing is that the tire feels a bit harder as it's been on the bike for such a time. I guess will need changing soon even though the thread depth is still good.